A few free spirits still live life on their own terms. Far from anything else, at the far end of an unmarked side road in the desert sits this small refuge. These modern-day pioneers have detached themselves from the rest of society and designed the lifestyle they wish to live, doing it their way. Living off the grid. It’s an interesting concept. 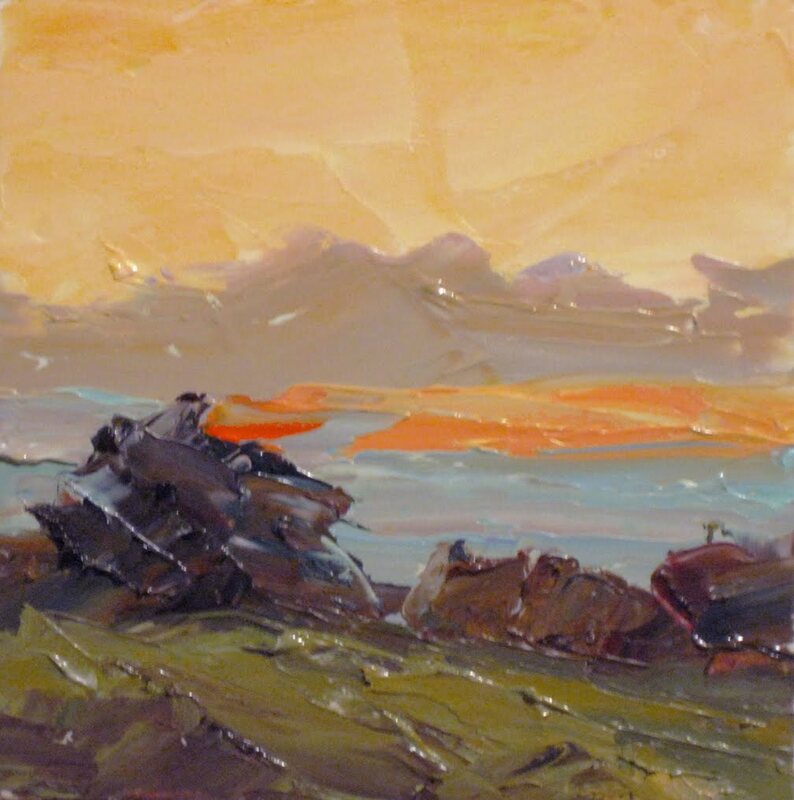 This is another miniature palette knife painting in the same series as yesterday’s post. I created an entire series of these little treasures which I am putting on eBay at VERY LOW prices. They’re only 4x4 inches, but in the right frame they really come to life. These paintings go right to the heart of the subject. No fussy details. Just the “big picture.” Stated with rich, juicy gobs of oil paint. Click the image to see the rich surface texture in this little jewel. Check out others on eBay now by clicking the link below. Note: Bid now if you like it. I began this eBay auction with an artificially low starting bid, which will be increased each day until the first bid is placed. 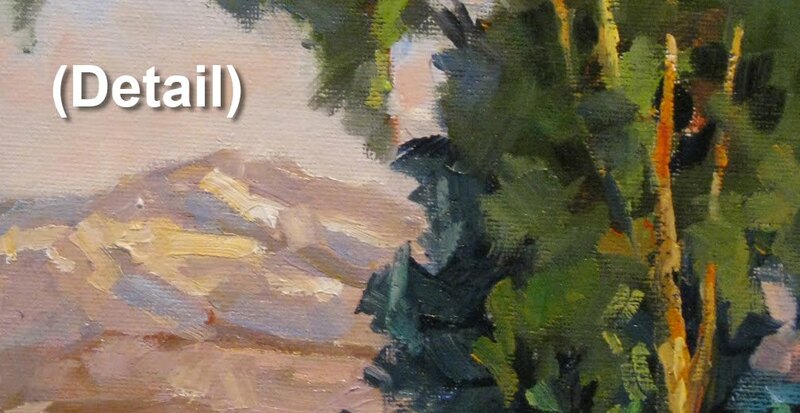 This is a miniature palette knife painting, and this little jewel really packs a punch. I’ve been having fun creating an entire series of these little treasures which I am putting on eBay at VERY LOW prices. They’re only 4x4 inches, but in the right frame they really come to life. At the foundation of every good painting is a strong abstract composition, and that’s the quality I was shooting for here. No fussy details. Just the “big picture.” Stated with rich, juicy gobs of oil paint. Click the image to see the rich surface texture. The crisp cool morning air gave way to sweltering sunlight as the day wore on. 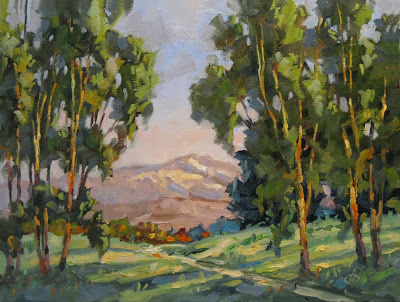 As the sun shifted in the sky I kept moving my easel to remain in the cool shade of these trees. Thank goodness for that shade! This was painted during a Plein Air Workshop I taught Saturday morning for a dedicated group of artists. Composition, brushwork and color mixing were among the things we focused on while painting this scene. It’s a spot along the Jeffrey Open Space Trail in Irvine, California. In the distance is Saddleback Mountain. 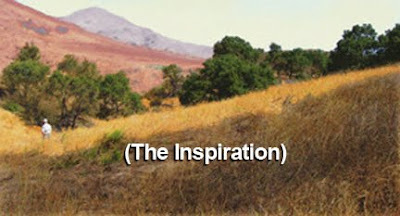 A very inspiring scene! I was particularly interested in capturing the delicate variety of colors we observed. Especially in the trees. And the mountains. And the sky. Well, the colors in everything I guess. 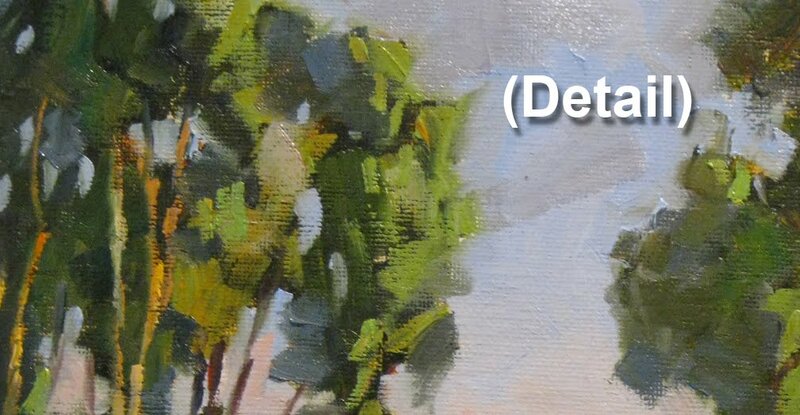 Click on the detail images for a better look at the delicious layers of juicy oil paint in this piece. 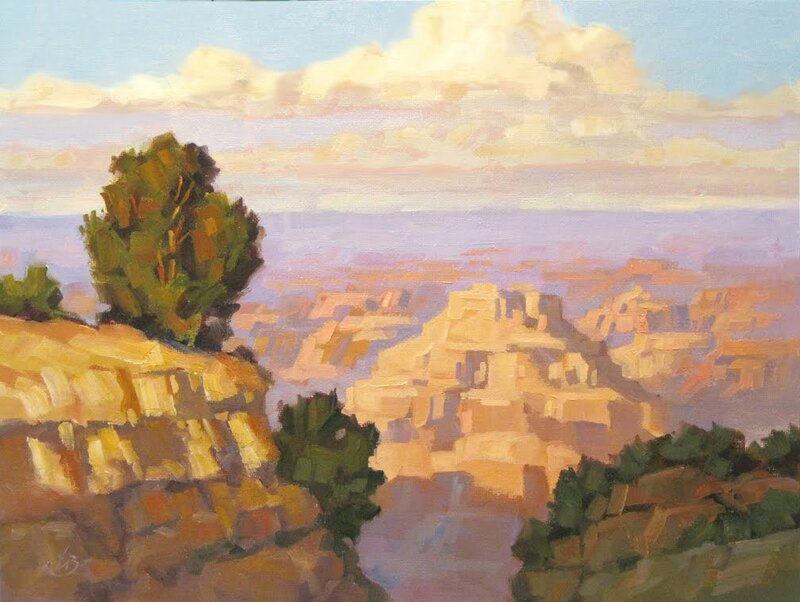 Many of the colors are quite subtle, with just enough vibrant color to bring life to the painting. Brush strokes were carefully considered to reflect the clusters of foliage in the trees, as well as the shape of the distant mountain. This painting is a study in contrasts. Contrasts in strength and durability, in textures, in light and shadow, in size and weight of objects. Surface materials. And more. The frailty of the baby sprout contrasts with the dead weight of a heavy steel wrench. 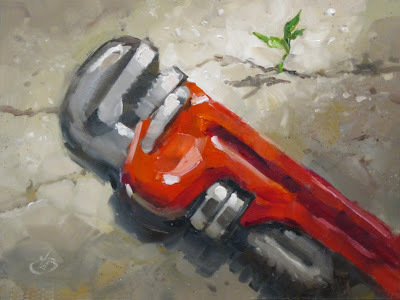 The shaft of light contrasts with a soft shadow falling across the wrench. Unyielding concrete gives way to a delicate plant. Somewhere in all this is a metaphor for life, I suppose. Things to meditate upon. Or maybe just some fun stuff to paint. Whatever. Big Event this Friday! I’ve mentioned on this blog that I recently participated in the Annual Huntington Beach Plein Air Festival. It’s a very competitive event that includes top artists participating by invitation only. 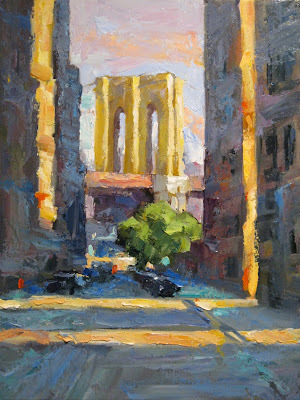 The opening reception for the show is Friday of this week, September 24, from 6:00pm to 9:00pm. 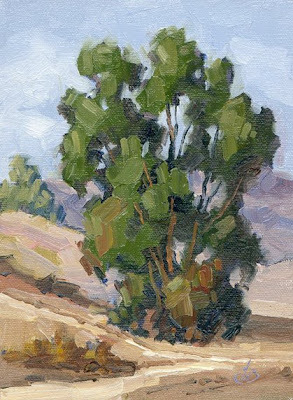 Several of my 12x16 inch plein air paintings are represented in the show, including my painting from the “Quick Draw” event. Come meet the artists in person and view an outstanding selection plein air paintings. Admission is free and open to the public. 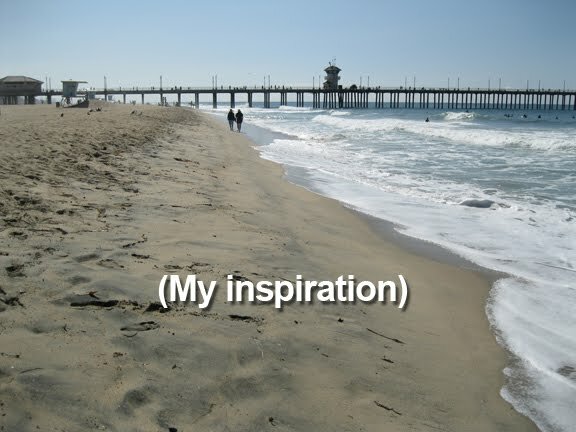 It’s held at the Huntington Beach Art Center, 538 Main Street, Huntington Beach, CA 92648. I hope to see you there. Somebody hiccupped when they were passing out musical talent, and I got skipped. 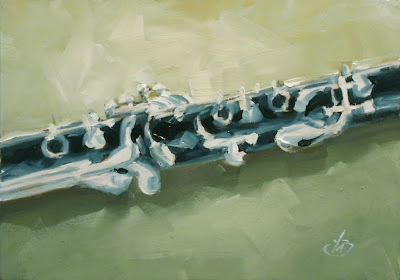 My father and one of my brothers were wonderfully talented on the clarinet, and my son is also very gifted on it. Currently my son prefers to pursue his art rather than music, and I can understand that. But while listening to Pete Fountain’s musical genius the other day I was inspired to pull out my son’s clarinet and paint it. This is the result. Did you ever have one of those days when you went for a walk in nature and felt totally at peace? It was like a momentary escape from all the cares and hectic pace of the daily world. Everything seemed calm, serene and pleasant. That’s the feeling I tried to put into this painting. I love rich, subtle color. Can you tell? I could give you the whole story about how this painting came to be, but I think it speaks for itself. If you’ve ever watched the indescribable hues dancing across the sky at this time of day, you can probably relate to this. 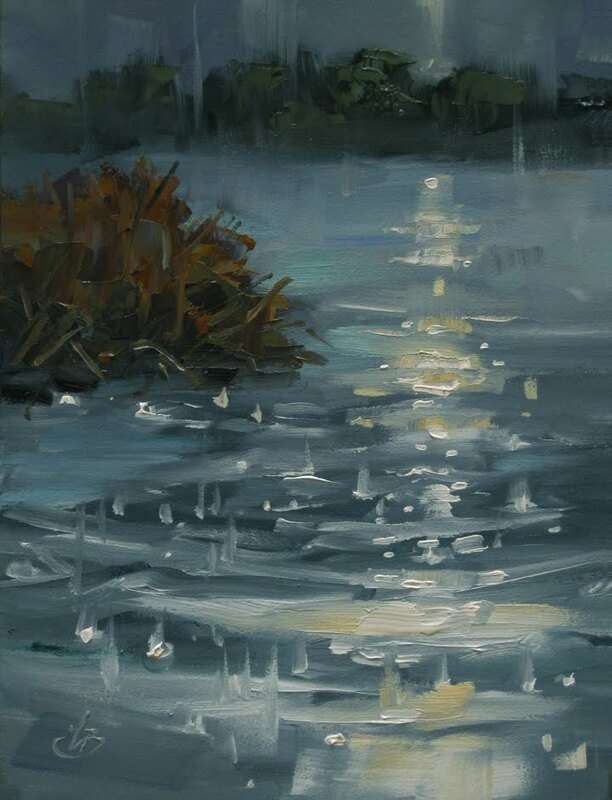 Check out the effect of raindrops hitting the surface of the pond in this painting. And the moonlight shimmering across the pond’s surface. I was pleased with these effects. 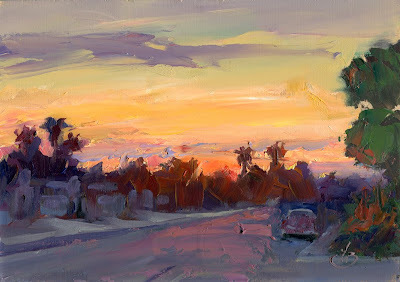 It was a terrible night to be out, so I didn’t paint this on location. I did a couple of pencil sketches on site and made written notes about the effects of the raindrops, light, reflections, color, etc. 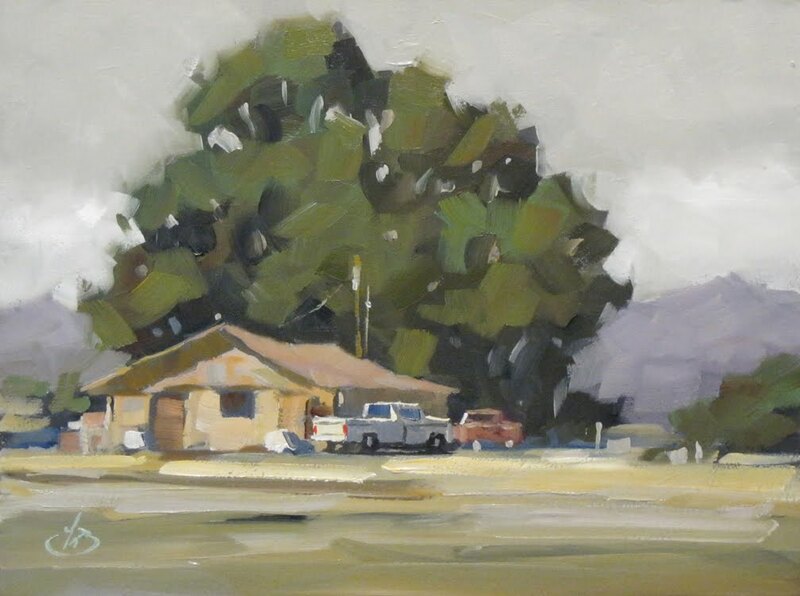 Paintings done on location often capture the feeling and mood of the scene far better than studio paintings. There’s nothing like being there to personally experience the sights, sounds and scents. And those feelings tend to become part of the painting itself. 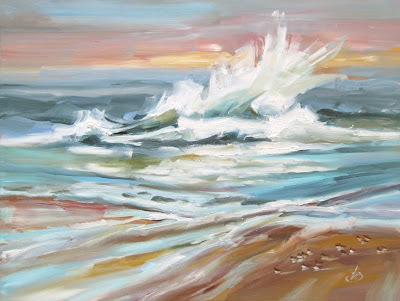 This is another memory-maker that captures the sensation of being at the ocean on vacation. This was painted on location, and the painting is loaded with rich, juicy oils. Click the detail image for a better look. -- Composition as you've never been taught! -- New "conceptual" approaches to subject matter. -- How to work "in a series" for added fun. -- My own personal techniques and materials to kick it up a notch. 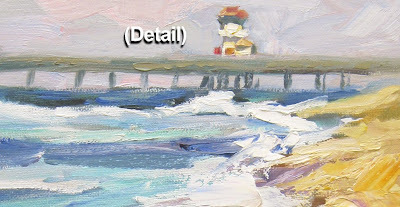 -- And much more. . . .
All locations are "user friendly" with restrooms, convenient parking and great scenery to paint. 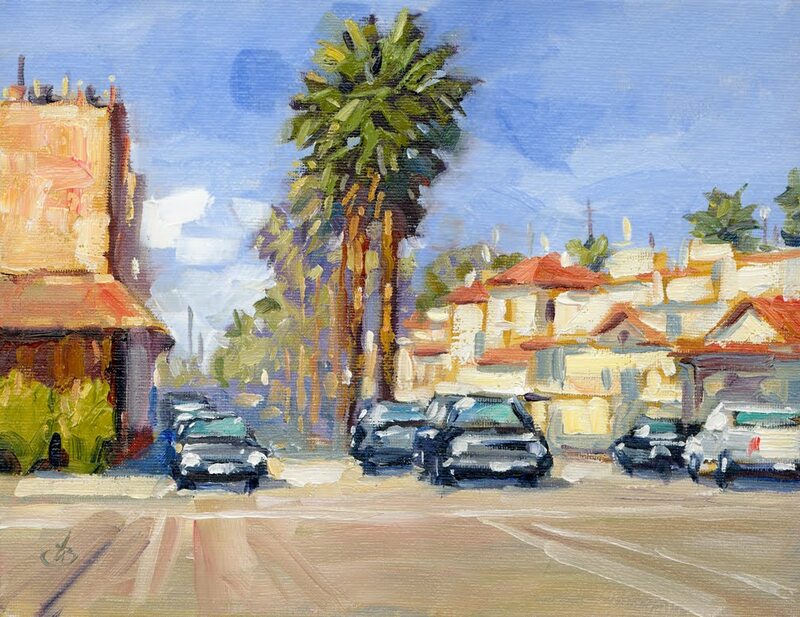 This painting of Balboa Island will bring back fond memories for anyone who vacationed in this picturesque area of Southern California. 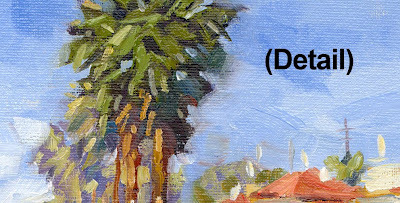 It captures the feeling of this charming little island, complete with palm trees, white stucco homes with red tile roofs, and palms lining the median strip. To make it better, this painting is loaded with rich, juicy oil paint that brings character and richness to the surface of the canvas. Check the detail images for a better look. This one speaks for itself. The breath taking view of Grand Canyon will stay with anyone who has ever stood at the edge of the canyon rim. And this magnificent painting will help keep those memories alive. 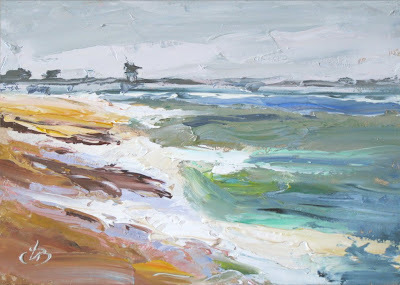 "WET FEET, WET EASEL AND EVERYTHING"
I painted literally at the water’s edge and everything got doused as I worked on this painting. Everything but the canvas. I managed to keep the canvas high above “splash level” and succeeded in getting it to safety when it was completed. After painting the small study posted yesterday I moved to the opposite side of the pier and decided to paint this much larger canvas. 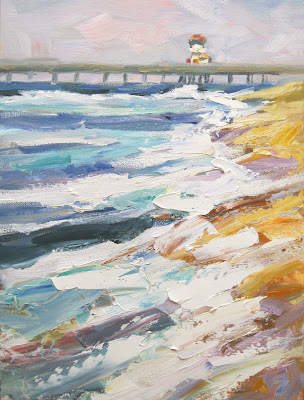 This is another painting done at Huntington Beach while participating in the annual Invitational Plein Air event. While participating in this event I completed more pieces than are permitted in the show, and decided to hold this one out. Thanks for looking and let me know if you like it. Sometimes I like to push things to see how far I can abstract it and still get a recognizable image. I like to go beyond the details nature offers and find the essence of the subject; the emotional magic that attracted me to it in the first place. 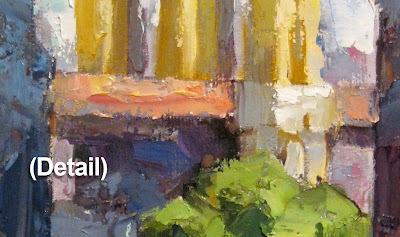 The heart of the subject is frequently not in details; it’s in the big shapes of color and value. The movement and rhythm of the scene. That’s what I went for in this one. 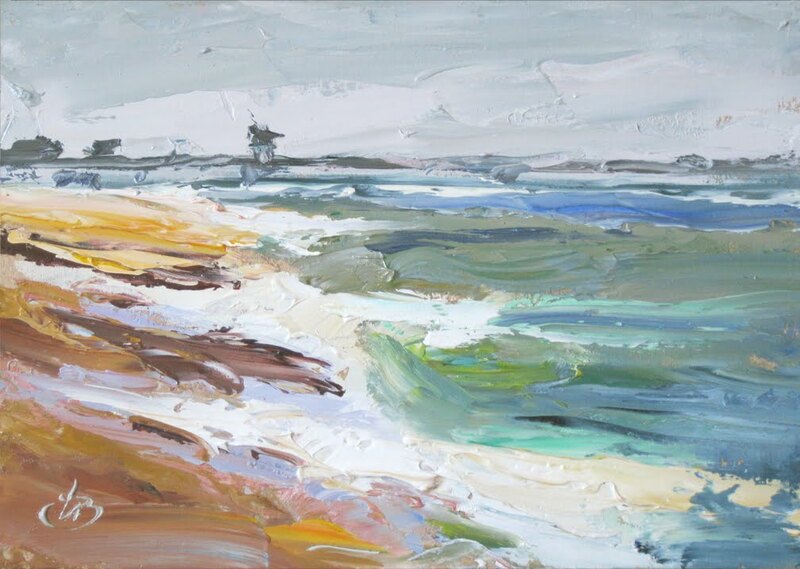 This is another 5x7 inch palette knife painting, done at Huntington Beach during the Invitational Plein Air event I am currently participating in. Let me know if you like it. Thanks for looking. 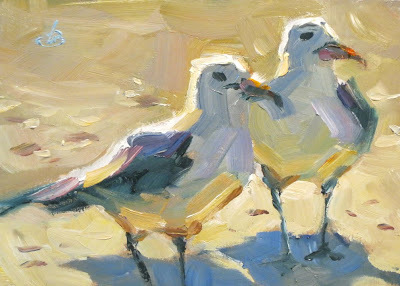 "WARMIN’ UP FOR THE DAY"
If you follow this blog you’ll know that I am participating in the Huntington Beach Plein Air Invitational again this year. Dozens of gulls were clustered in the sand as I set up my easel yesterday, and I decided to paint these two as a warmup for the day’s painting. I liked this painting so well that I decided to paint a slightly more involved piece for the official show. The opening reception is Friday, September 24 from 6:00pm to 9:00pm at the Huntington Beach Art Center. If you’re in the area on stop by and say hello. Admission is free and there will be lots of wonderful plein air paintings on display. As a small boy I once presented my Mom with a beautiful bouquet of flowers that I had found growing around the edge of our yard and the neighbor’s yard. Imagine her surprise. 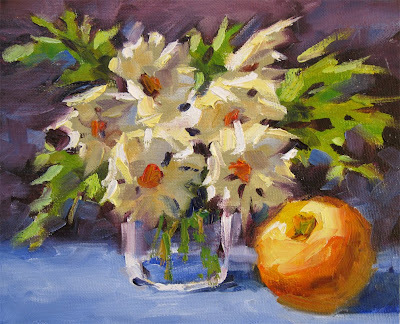 Daisies were part of that bouquet and I recalled that childhood memory as I was painting these daisies from my own yard. 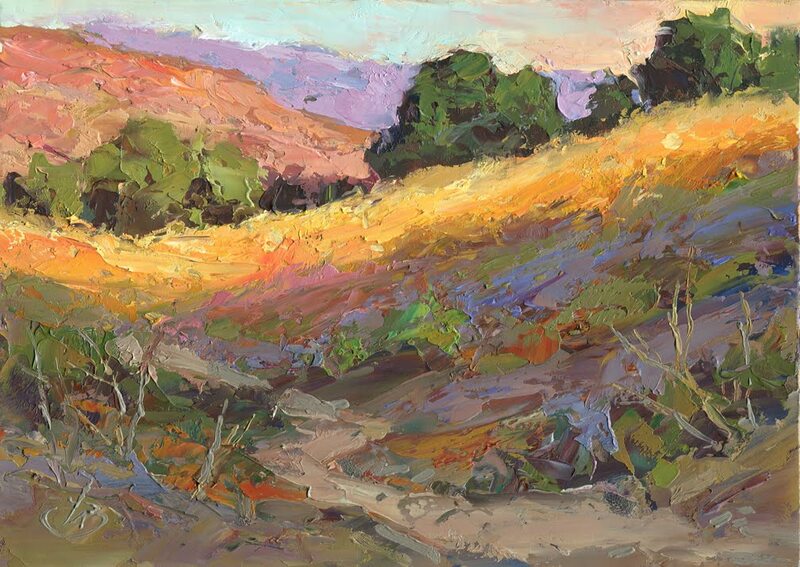 Summer is drawing to a close and this is a final tribute to summer colors. 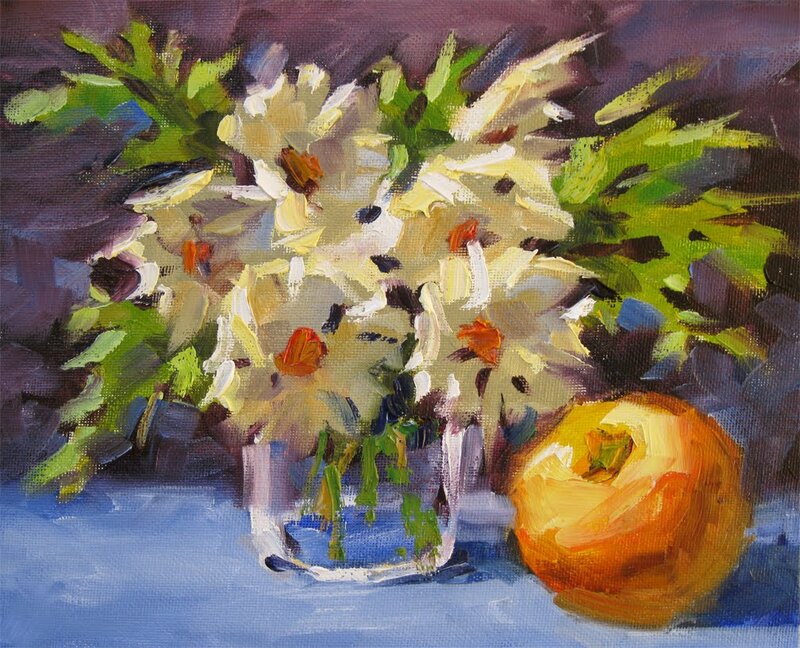 I felt the orange and blues in this composition helped bring out the beauty of these simple flowers. I hope you agree. 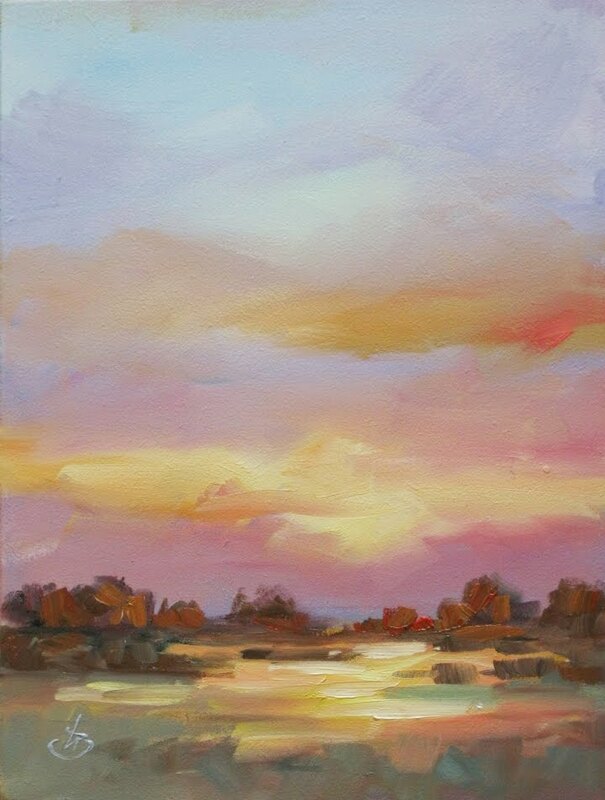 "MUDDY SHOES AND GLOWING SKIES"
Three simple things go into a painting like this. I’m third generation artist; mom was an artist, so was her dad. That helps. 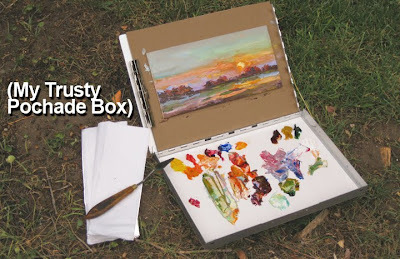 In this case, my trusty pochade box and a palette knife. I love the immediacy of simply opening the paintbox, grabbing a knife and capturing the moment. No solvents to spill, no brushes to clean. Just me and the paint. Oh, one more thing. You need to be willing to get mud on your shoes. This is a “wetland” after all! 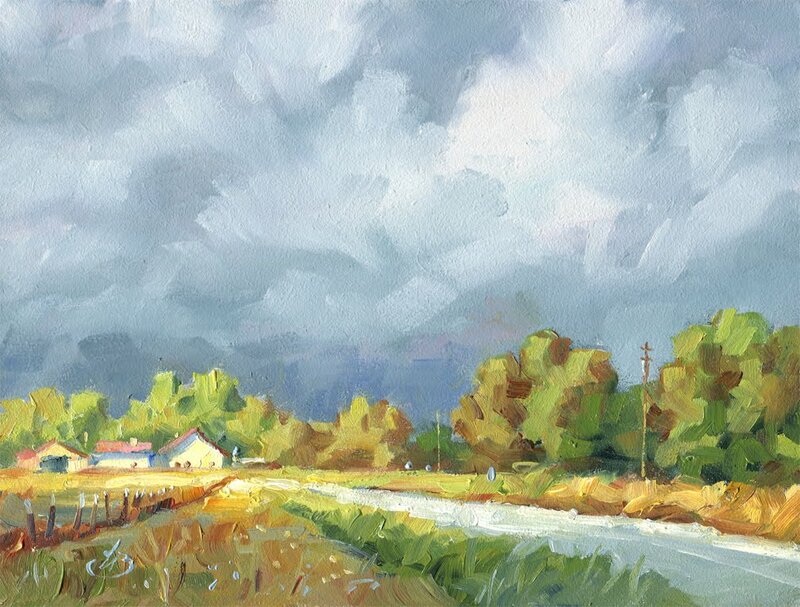 Crackling thunder and ominous skies didn’t hold much promise for painting outdoors. Then suddenly, a window in the clouds opened and a slice of clean light sparkled across the road ahead. There it is, I thought! Today’s painting! The break in the clouds lasted just long enough for me to capture it in this painting. Bullet sized raindrops began pounding down as I finished. I ducked into my car and safely tucked away this painting. Got it! It was a perfect day after all. The clean, fresh scent of rain sweetened the air as I made my way happily down the road. I hope this adds a bit of freshness to your day. Thanks for looking. I guess that’s why I paint. 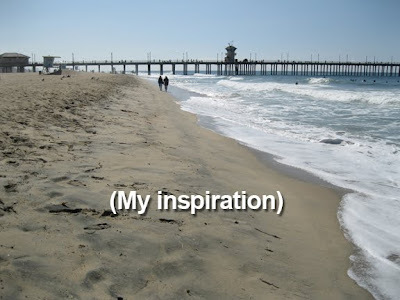 To reach out and connect with someone else; to share my experience of life. It’s one of the reasons anyway. Every painting is a hunt, a chase. It’s an attempt to capture something unique, something of value. To give solid form to a fuzzy observation or feeling. And share it with someone else. It’s a way to complete an experience. How can I witness a dramatic setting like this and not share it? That’s what this painting was all about. I was able to shoot a photo, too. (In the photo you can see a friend who was with me.) 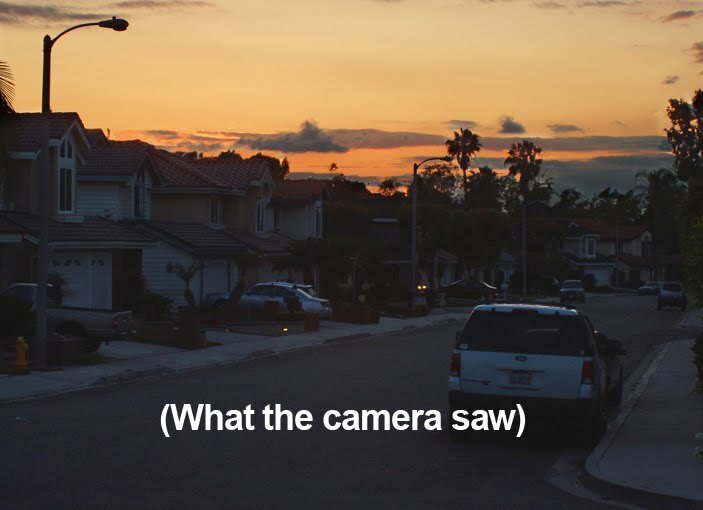 But the camera doesn’t always see the world the way I do. So I put my view of it into this painting. Hope you can relate. If so, enjoy. And have a colorful day. "CATCH IT IN YOUR HANDS"
Blazing sunsets are awe-inspiring; nothing new about that. But did you ever risk trying to catch and hold one in your bare hands? 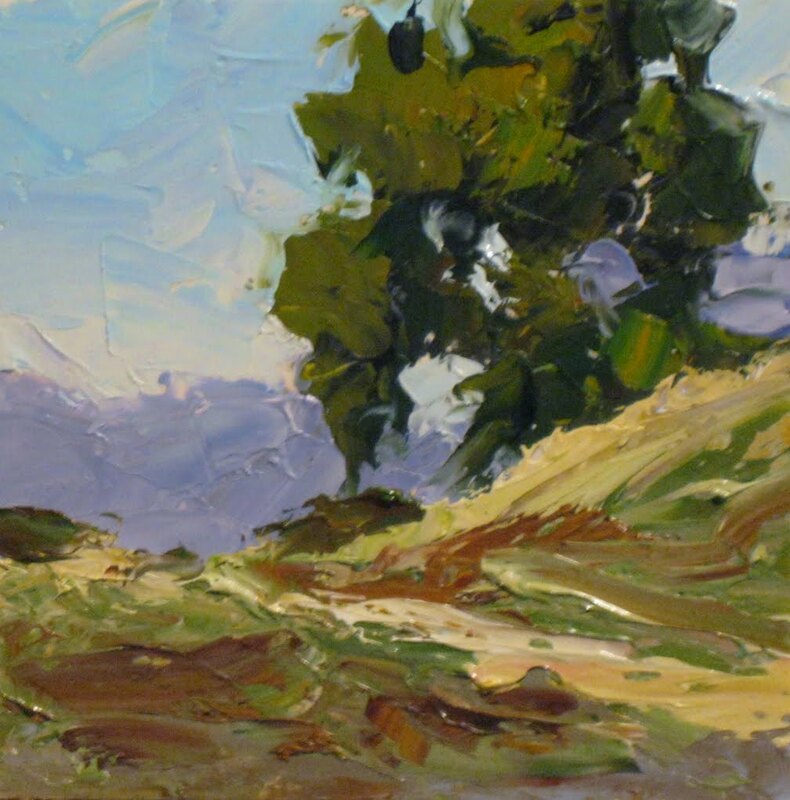 That’s what it feels like when you confront nature with paints and brushes at a time like this. It’s intimidating to say the least. This particular moment caught me off guard. I was in my garage unpacking the car after a day afield with my paints when I glanced up the street and witnessed this final delight. Standing in the open garage I grabbed a brush and let the paint fly. It was a final “hurrah” – and then it was gone. It’s scary how briefly this moment lasted. 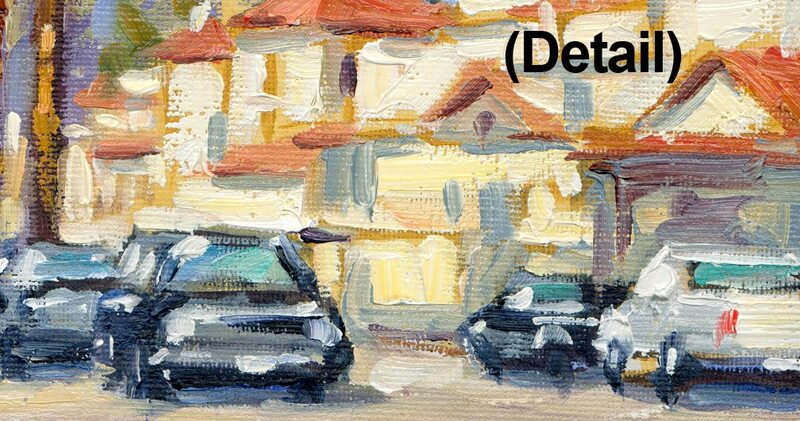 When I paint something like this I skip the boring details: cars in the driveways, mailboxes and lamp posts, stuff like that. I go right for the treasures: colors in the sky, the streaks of purplish clouds, the reddish glare diffusing the trees where the sun is sinking. That’s what it’s really about anyway. I shot a photo too, but it isn’t quite the same. The camera’s version lacks the emotion I felt. I guess that’s one reason I do this; to capture what I feel, the “WOW” of the moment. And to share it with others. Hope I succeeded. If so, enjoy. And have a colorful day. Bid now if you like this. I am beginning this auction on eBay with a very low starting bid, which will continue to increase until the first bid is placed. 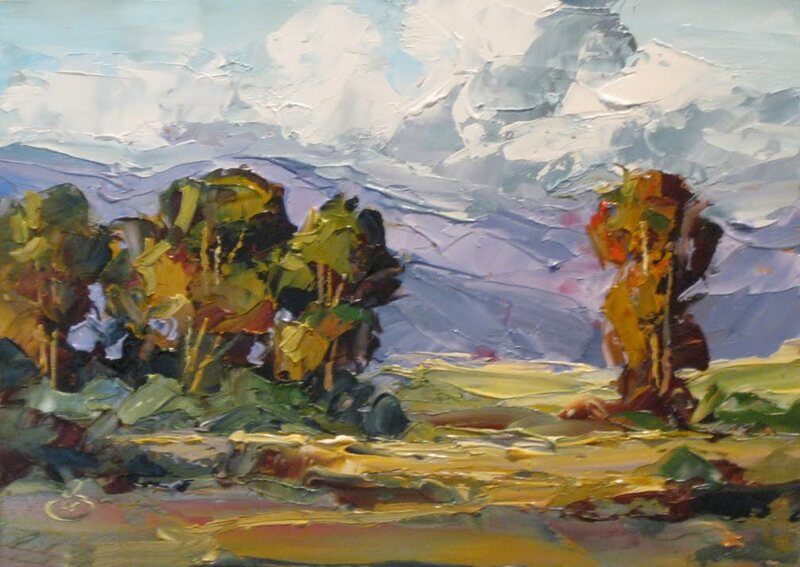 “Brush strokes” are very crisp and decisive in paintings done with a palette knife. 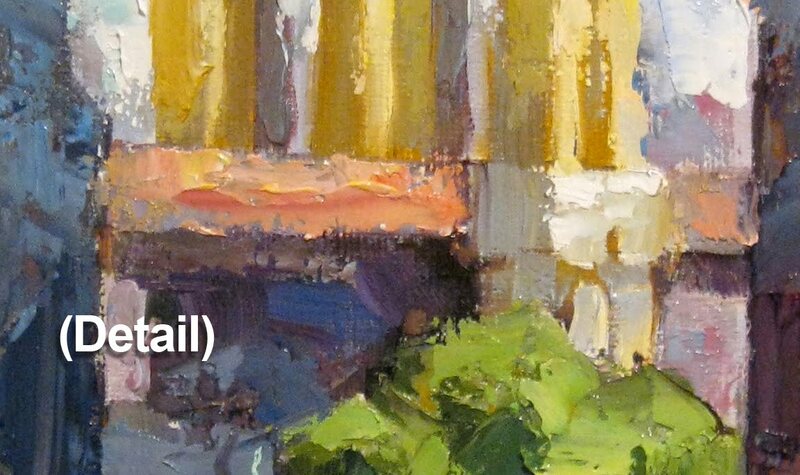 Colors are placed with a directness that sparkles on the surface. 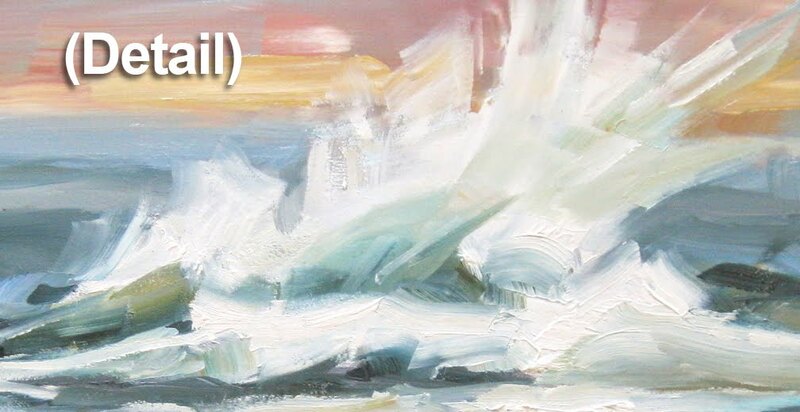 The finished paintings always bring a special freshness to a room. Click on the detail image for a better look.